Abdominal US revealed a large heterogeneous lesion in the right suprarenal region that arises from the adrenal gland (Figure 1). A CT scan of the abdomen revealed a 7-cm heterogeneous right suprarenal mass with attenuation similar to the liver (Figure 2). Pheochromocytomas arise from the chromaffin cells of the adrenal gland. Anatomically on CT each adrenal gland can be seen as alinear or inverted Y- or V-shaped organ located superior, medial, and anterior to each kidney. Several imaging modalities can be used to evaluate the adrenal gland; these include CT, magnetic resonance imaging (MRI), nuclear medicine, and US. 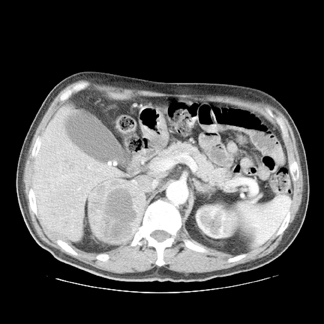 On CT, pheochromocytomas can be seen as homogeneous or heterogeneous solid or cystic masses, possibly showing some calcification. Most pheochromocytomas have attenuation higher than 10 Hounsfield units (HU). Rarely do they contain sufficient intracellular fat to have an attenuation of < 10 HU, although some pheochromocytomas may demonstrate very high attenuation due to hemorrhage.1 The extent of attenuation of the adrenal gland differentiates adenomas, adrenocorticocarcinomas, pheochromocytomas,and metastases.2 Boland et al.,3 performed a meta-analysis of 10 studies to determine an optimal threshold for differentiating benign lesions from malignant. From this study, a threshold of 10 HU had 71% sensitivity and 98% specificity for characterizing adrenal masses. On MRI, pheochromocytomas are usually seen as hypointense or isointense relative to the liver on T1-weighted spin-echo (SE) images, and they are highly intense on T2-weighted SE images. The cause of this appearance is unknown, but it likely results from the high water content in cellular homogeneous tumors or the high water content in necrotic regions.1 Some investigators have reported that pheochromocytomas can have atypical signal characteristics on MRI in up to 25% of patients.3 Nuclear imaging is another study used to detect lesions that are not adequately seen by a CT scan or MRI. Pheochromocytoma shows intense uptake of metaiodobenzylguanidine (miBG), thus allowing for detection of small lesions in atypical areas. 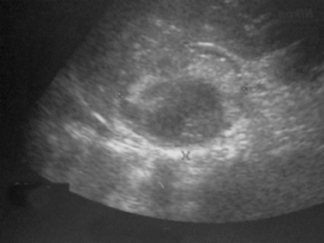 Ultrasonography is limited to the differentiation of cystic lesions from solid lesions in the adrenal gland. Pheochromocytoma incidence could be increasing because of changes in detection methods.4 CT and MRI have resulted in more frequent and incidental detections of adrenal masses. Characteristically, these symptoms are paroxysmal and may be precipitated by abdominal exertion, such as heavy lifting or performing the Valsalva maneuver. Some individuals can be asymptomatic, which explains why imaging studies are useful in diagnosing these tumors. About 10% of pheochromocytomas are malignant, bilateral, familial, and extra-adrenal. Diagnosis is usually based on clinical presentation and imaging and biochemical studies. Blake MA, Kalra MK, Maher MM, et al. Pheochromocytoma: An imaging chameleon. Radiographics. 2004;24:S87-S99. Szolar DH, Karobkin M, Reittner P, et al. Adrenocortical carcinomas and adrenal pheochromocytomas: Mass and enhancement loss evaluation at delayed contrast enhanced CT. Radiology. 2005;234:479-485. Mayo-Smith WW, Boland GW, Noto RB, et al. State-of-the-art adrenal imaging. Radiographics. 2001;21:995. Baguet JP, Hammer L, Mazzuco TL, et al. Circumstances of discovery of phaeochromocytoma: A retrospective study of 41 consecutive patients. Eur J Endocrinol. 2004;150:681-686. Lee TH, Slywotzky CM, Lavelle MT, Garcia RA. Best cases from the AFIP: Cystic pheochromocytoma. Radiographics. 2002;22:935-940.